Write group stories that get saved to each child's portfolio and shared with families of all children linked. Parents and extended family can comment. These comments and teacher replies to those comments are private, seen only by the family member(s) making the comment and the child's educators. Note, teachers can also comment on stories written by other teachers - exactly which stories depends on your class privacy settings. These comments are seen by everyone connected to each child in the story, teachers and family. A story can be any kind of update, from a few words, a video or photo to a full learning story. 1: Go to click the "Children" tab. 2: Click on "Create a Group Story." This takes you to the Create Group Story page. 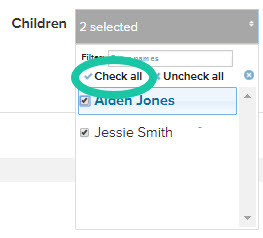 3: Once on the page, use the drop down menus to click on the class(es) the children are in and choose the children the story is for. 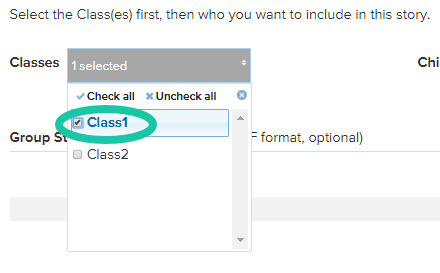 4: After selecting a Class, you can choose all to post to all the children in that class by clicking on "Check all" in the Children drop down box. 5: You can then choose a file (Word or PDF) to upload if you wish. This is added the same way when using the "Upload Story" feature on a child's profile. 6: Now fill out story details (title, date, story, plan(s), curricula) as in an individual story. This includes the story approval workflow if set up on your site. For more info, please see our Create an Individual Story help article. Note: Group Story file allows you to upload a group story written in other software programs such as Microsoft Word, Publisher, PowerPoint or Apple Pages. Before you upload, please export the file into PDF file format, because it’s the most common file format that can be opened on most computers. Educa only accepts documents in PDF format with a file size under 8MB when uploading a group story file.